Hi I am Carl Starkey, from Shipston On Stour, and I am your local mobile caravan servicing engineer. 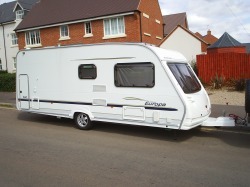 I offer a friendly, affordable and mobile caravan service in the midlands. Please see this map to see the area I cover. basically all of Warwickshire, Oxfordshire, Gloucestershire, Worcestershire, Cotswolds and surrounding areas. No job too big or too small so please give us a call. This means if you have a new caravan or motorhome we can service it for you and keep your warranty intact. We are approved and warranted to work on Truma, Dometic, AL-KO, BPW, Whale and Alde products. We are trained by Caravan Industry Training Organisation (CITO). You no longer need to take time off work, spend money on fuel and waste a day traveling to have your annual service, repairs or installations carried out. We will come to you at home, in storage on or site. We offer an emergancy call out service for when things don't go to plan, whether you are at home or on holiday you can call us.